I'm always writing about Japanese food from the perspective of a person living outside of Japan, where it's naturally more difficult to get a hold of various ingredients. Japanese food prices outside of Japan are more often than not priced in the range of luxury gourmet items. I feel that most books written about Japanese cooking for a non-Japanese audience don't address the issue of the difficulty or expense of getting the right ingredients outside of Japan or an area with a big Japanese population. While I can rely on my mother to supplement my pantry, I've had to pare down what I do purchase and keep there while still being able to reproduce those "flavors of home". These are things I always have in stock. If your interest in Japanese cooking is limited, or you're on a tight budget, concentrate on this list first. Medium grain rice, white or brown. This is most often sold nowadays as "sushi rice". Japanese cuisine is based on rice. See this basic Japanese rice primer in the archives. See also: Looking at different types of rice. Japanese soy sauce. Soy sauces produced by various soy-sauce-using countries do differ. For Japanese food, use Japanese soy sauce, rather than Chinese, etc. A good, widely available and not too expensive brand is Yamasa. Kikkoman is okay, and generally not expensive since the company produces it worldwide rather than shipping it from Japan. You can spend a lot for good soy sauce, an there is a difference in flavor, but it's not totally necessary to do so for most everyday needs. White miso (shiromiso). There are different kinds of miso, but the white (actually a pale yellow-brown) kind is the most versatile. Bonito flakes (katsuo bushi). Not only is this used to make dashi stock, but it's also used as a condiment in so many foods such as tofu, blanced spinach, and so on. A purist can get a solid dried bonito and shave their own, but the pre-shaved bags are more convenient. Konbu seaweed. Essential for making good dashi stock, as is bonito flakes. Sake. In a pinch a sweet sherry can be substituted, but many Japanese foods include sake as an ingredient. You don't have to get an expensive brand - as long as it's drinkable it is fine for cooking. Mirin - sweet fortified liquor made from rice, used exclusively in cooking. Rice vinegar. Rice vinegar is mild and sweeter than white wine vinegar. You will also see something called sushi vinegar - this is just rice vinegar with added flavorings, mainly salt. Making sushi vinegar mix is so easy that I don't see a need for stocking sushi vinegar. Dried shiitake mushrooms. More intense in flavor than fresh, they are used a lot as a flavoring as well as an ingredient. Sesame seeds. These are often used toasted and ground up, or whole as a condiment. Dark sesame oil. This is used for flavoring many dishes, especially chuuka (Japanese Chinese-style) dishes. Green tea leaves. Sencha is the standard green tea (shincha is new sencha), and there is kukicha (made from the stems), genmaicha (with toasted rice), hatomugicha (with toasted barley), and so on. Matcha, or powdered green tea, is not made that much in the home (you get it at tea ceremonies, prepared by a skilled person), but it's often used nowadays for cold drinks and ice cream. Non-Japanese dry or bottled ingredients that are used a lot in Japanese cooking: salt, sugar, Worcestershire sauce, mayonnaise, potato starch flour or cornstarch flour, white wheat flour. Fresh ginger. Powdered ginger cannot be substituted. Spring onions or green onions and leeks. Leeks are used more than onions, though onions are used in a lot of Japanese Western-style dishes or yohshoku. White daikon radish. In Europe, mouli can be substituted. Used cooked as well as raw; in stews, soups, as garnish, etc. Grated daikon radish cuts down on the oiliness of things like tempura and grilled oily fish. In a pinch you can use red radishes instead, especially for salads, grating and so on. These are ingredients that are staples of a Japanese kitchen, but aren't as essential as the ones above. Tofu and tofu products such as aburaage (fried thin tofu), atsuage (tofu blocks that have been deep fried), kohya dofu (frozen and dried tofu, somewhat spongy), okara and yuba (very thin sheets of dried tofu). You might wonder why tofu isn't in the Essential category. While tofu is ubiquitous in Japanese cooking, you can still get Japanese flavored dishes without it. Wakame seaweed. This is available either preserved in salt, or dried. The dried kind is easier to handle. Used in miso soup, salads, and as sashimi garnish. See hijiki, wakame, konbu/kombu. Nori seaweed. The black dried sheets used to wrap sushi rolls, also used shredded as a topping and so on. It's even cooked to a paste to eat with rice. Seven-ingredient red pepper powder (called shichimi togarashi or sometimes nanami togarashi. Togarashi is sometimes spelled tohgarashi). This is a coarsely ground red pepper condiment that's used on udon noodles, cold tofu, and so on. It has ground up yuzu peel, sesame seeds, and other good things in it. Ground curry powder. Curry flavor is very popular in Japan. See curry powder formula. Mustard paste or powder. This is plain mustard (equivalent to English mustard powder, e.g. Colman's), not the kind with vinegar. Japanese pepper (sanshou). Available usually in powdered form, though in Japan fresh sanshou is used too. Dried anchovies (niboshi). This is used as an alternative to, or in addition to, the classic konbu seaweed and bonito flake combination for making dashi stock in some regions. Various dried foods: hijiki, a dark seaweed; kanpyou, dried gourd strips often used in sushi rolls; kiriboshi daikon, dried shredded daikon radish. See hijiki, wakame, konbu/kombu. Various dried beans: azuki, black beans (kuromame), and white beans (ingenmame) are the most commonly used. Various dried noodles: soba, so-men (thin white wheat noodles), udon, etc. Umeboshi, or pickled plums. Nowadays touted as a macrobiotic food product, umeboshi is part of my childhood. Used in rice balls, in bento boxes, and as flavoring for various things. Red miso (akamiso). This is a bit stronger in taste, and usually more salty, than white miso. Short grain sticky (glutinous) rice (mochigome), used for some sweet and savory dishes (such as Japanese red beans and rice, or sekihan. Various fish-paste products such as chikuwa - used in soups and oden (a sort of stew). Shiso leaves. Shiso (perilla) is the most common herb used in Japanese cooking, about as useful as fresh basil is in Italian cooking. The green kind is used fresh, and the red kind is used for pickling. Sesame chili oil (ra-yu). Dark toasted sesame oil infused with red chili. This can turn rancid fast so store after opening in the refrigerator. Rice bran for pickling (nuka). People of an older generation in Japan pine for the flavor of nuka zuke - vegetables pickled in wet fermented rice bran. I seem to have been born younger than the nuka zuke cutoff point or something, since I don't really miss this type of pickles, though I have thought about making my own nuka doko (rice-bran pickling bed). It's sort of like minding a sourdough base. Instant dashi stock granules, as backup. There are lots of these of course, but here are a few that are often mentioned as 'essential' Japanese ingredients, but I have little use for. Furikake. I will write about furikake in depth soon, but in a nutshell it's a dried, flaked topping for rice (if you remember that Japanese food mostly centers around plain, white rice, a lot of things make sense) and comes in various flavors. A certain "gourmet" newsletter lists it as some kind of wonder food, which is sort of funny since I always grew up with the notion that furikake was sort of low-class. My maternal grandfather, a rather strict gentleman, didn't allow it on his table. But I do love it. Keep in mind that most commercial furikake is loaded with MSG. I like to make my own as time allows - see furikake recipes on Just Bento. Ajinomoto, aka MSG. A lot of Japanese households still have a bottle of this, but I find the flavor a bit too harsh. For more about Japanese flavors, see the SaShiSuSeSo article from the archives. And if you are serious about Japanese cooking, don't miss the Japanese essence in a bottle. Submitted by maki on 2006-08-09 17:15. Thank you so much. I love Japanese food and have wanted to learn how to make more of it at home, but I've struggled because I'm drawn visually to Nobu's cookbooks and other fancy, pretty books. Now I can learn the basics before I begin experimenting with more expensive ingredients. Wow -- lots of good ideas to add to my own Perfect Pantry! Thanks. White daikon radish. In Europe, mouli can be substituted. But this sentence makes me wonder. Mouli is a large white radish that's commonly sold in some countries in Europe. It's also called bierrettich (beer radish). Question about brands of Japanese pantry items here... Are there brands that you'd recommend for soy sauce, mirin and cooking sake? I'm in Taiwan where I can get my paws on some Japanese imports so would like your recommendations. Moreover, I just got a bottle to Taiwanese made mirin-like liquid seasoning (みりん風調味料). Tastes fine to me but I was wondering if this would be an inferior product to hon-mirin (本味醂) - minus the provenance factor :P. BTW, sake is just rice wine, is it? So I guess I could just use Taiwanese rice wine as a substitute... Would like to know your 2 swiss francs on the subject matter. If you want to splurge a little you can try the ones that says "Maru Daizu" - Yamasa makes one, as does Kikkoman, and other makers. For dipping only you can try more expensive ones but for every day cooking those would be fine. Mirin seasoning vs. Hon Mirin: Mirin seasoning just has much less alcohol, while Hon Mirin has about 17% alcohol (varies according to the brand - check the label). So you can use the Mirin seasoning for dishes you won't be heating, if you prefer. Flavor wise I think Hon Mirin has more flavor but Mirin seasoning is fine really. Sake and Taiwan rice wine - they are different but I think you can substitute (try tasting both to see if there's a huge difference...) for example some mainland Chinese rice wines are very strong and/or sweet and different from most Japanese sakes. Just like say a California Chardonnay is very very different from say, a German Riesling. Now wots your take on the cooking sakes (料理酒） that I see in the green plastic bottles in the supermarkets? Make the cut? Cooking sake of the cheap variety has additives like salt, sugar, and MSG, so I tend to avoid them. Though there are expensive 'natural' cooking sakes...but they aren't cheap. Well I am no sake expert by any stretch of the imagination. I'm not a regular sake drinker either. I just have whatever jizake (locally usually-microbrewed sake from various regions) that my mom happens to bring along... they are usually very nice, light, and drinkable ice cold. For whatever it's worth, I do not like atsukan (hot sake) too much - I prefer it cold always. So...I don't think I can recommend any mass-produced sake...not that they're totally bad or anything, but my sake needs are met by the jizake. For cooking purposes I just use a regular Gekkeikan or something (which is middle-of-the-road) though sometimes I'll use up some getting-older jizake that's around (sake does not age well). Got a little giggle about furikake. I had read about it in researching onigiri and finally found some to try. We did discover that we liked it for that quick meal of rice and tuna or surimi that we whip up some nights when we really don't want to cook. I was telling a friend of ours about it; however, when he mentioned that he would be hosting some Japanese business acquaintances, I warned him that if he discovered he liked it, he might not be too quick to brag on it to his business friends lest they think he was a bit lowbrow. LOL. I always have used Kikkoman brand mirin, but my local Safeway recently stopped carrying it and I had to buy the Sun Luck brand. I definitely noticed the Sun Luck didn't have as much flavor, so as soon as possible, I went to my local Japanese store and bought a large bottle of the Kikkoman. But THEN I read the ingredients on each brand! Kikkoman is LOADED with corn syrup and other added sugars! The Sun Luck says it is just fortified rice alcohol......no added sugar. No wonder the Kikkoman seems to taste so much better. My husband is diabetic, so this is very important in our family. Just thought other people might want to know this, also. Thanks, Maki! Thank you Maki! I never thought about just using sake - duh! I've already cut out the added sugar in the Japanese "essence"......my mother-in-law's recipes all seem to call for shoyu, mirin, and "a little sugars". Another reason I like your website, you have a lot of good vegetable recipes that are good for diabetics. Thank you again! I can't eat wheat (so no shoyu) but some tamaris are fine. You don't seem overly fond of the stuff, but is it ok to use tamari if normal soy sauce is off the cards? Or is it best not to bother making the recipe? By the way, I discovered your site through "recommendations" on Google Reader recently and haven't looked back since! Thanks! We're soon moving back to the U.S. after four years living the good life in Kamakura. After a recent trip back to Texas (our new home), I know it will be a challenge to get many of the now-familiar basics that I can usually get at my local Seiyu or from Manaka, our vegetable delivery truck or from the green-grocer down the hill. So, I'm stocking up on what I can mail or ship and praying for the best. Thanks for providing this "pantry list" as well as mail-order vendors for everything from equipment to seeds. I'm sure that once we get settled, I'll be making quite a few orders! Good list! If I have one nitpick it's that the mayo in Japan seems to taste different than the mayo back home; it seems a bit sweeter. Is it just me? I don't usually like my お好み焼き with mayo, but if you do and wonder why it tastes different then maybe that's something to keep in mind. I am stocking my kitchen with your recommendations but am a little confused about which seaweed or konbu to buy for making dashi stock. At the market all I saw were the nori roasted seaweed in sheets - couldn't find konbu. Can I use the nori to make dashi - isn't it all seaweed after all? I just recently moved to nagoya and of course all of these ingredients are accessible to me. But the problem I have now is that my fridge and cabinets are pretty much empty. I'm looking to cook beyond yohshoku foods (cooked way too much of it back home). Would this must have list remain the same or is there something else that I need to consider? Thanks and keep up the great work!! Actually the list above only lists one yohshoku ingredient (curry powder). 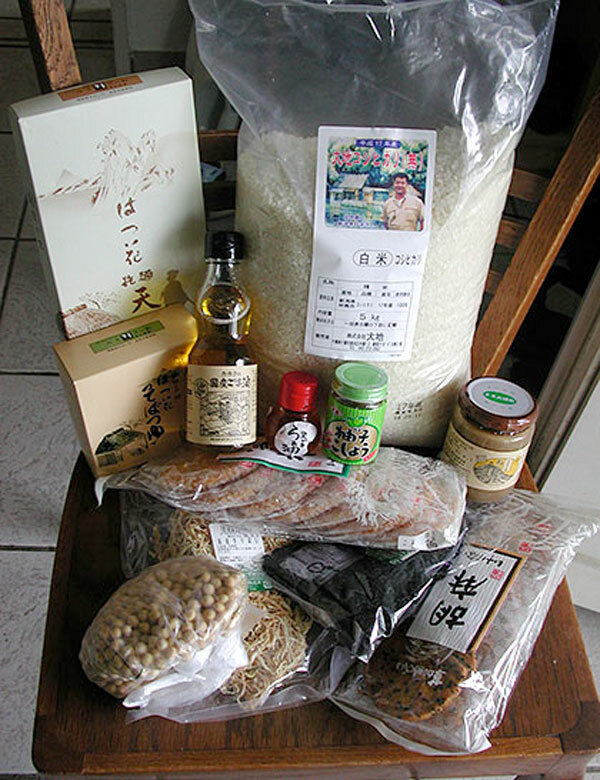 The rest are things you use mainly for washoku, or traditional Japanese cooking. For yohshoku you'd add tonkatsu or 'bulldog' sauce, mayonnaise, and ketchup, plus milk (to make bechamel) and pasta, and you're basically good to go. With the ingredients on this list, plus fresh produce and fish, meat etc you can make any kind of Japanese recipe you want. Could I please ask which brand of mirin you use? Takara? Thanks so much! I always forget something that winds up being a key ingredient, this is GREAT! Does anybody know if daikon freezes well? There are loads of wonderful daikon recipes that I'd love to try, but I live alone, so buying a vegetable the size of my arm (are they that size everywhere?!) would probably serve me better as a self-defense weapon than a meal. I'd love to be able to slice that thing up, then pull chunks out of the freezer as I need them. Or should I just give up and use red radish? Daikon does not really freeze well - the fibers break down and it gets all mushy. You can freeze grated daikon, to use as garnish, but imho it's not really worth it (it's so easy to grate). However, a daikon lasts for a very long time if you keep it well wrapped in your vegetable drawer - like a month or so in my experience (provided your refrigerator is at a proper temperature, i.e. around 5 degrees C / 41 F) Plus it's so low-calorie! I love Mirin made by Clearspring. Its not cheap but is so delicious. Whenever I use it I always put a slug in the palm of my hand for 'tasting' purposes. Thanks for the recipe for aubergine with miso. I always get it in the restaurant and now can make it, it is delicious! I always use rum instead of mirin. It seems to work out well. Great post, it's sometimes good to do a haul to make sure you have the right ingredients before you get started with something! I reaaallly should've refreshed my memory with this page before making your teriyaki chicken! Silly me thought we had mirin when really we had rice wine vinegar. Still edible, but vinegary. Not that bad, actually. Can you recommend a good place to buy dried yuzu online? I've been unable to find it (fresh or dried) in any of my local shops. I'm desperate to try some of the fast pickle recipes as I am a pickle *fiend*. I love Japanese food but it's quite sad that getting ingredients for Japanese food is very difficult.So are the ingredients you've mentioned above are easily available ? The must-have ingredients are all available via mail order, from Amazon.com if you're in the U.S. The bigger Whole Foods stores carry them too. The other ingredients may not be as easily available unless there is a Japanese grocery store in your neighborhood, but then again they aren't essential. See the Worldwide Japanese food shopping guide and look for stores in your area. I have found that radishes are a good substitute for grated or pickled daikon, but not for simmered or otherwise cooked daikon - they lack the sweetness of daikon unfortunately. I am a college student doing a project on Japanese cuisine, I was hoping that maybe you can help me clarify some questions. Mainly I wanted to know, is it normal for the japanese culture to use flavoring ingredients on their soups like Lobster bisque bouillon, or any other type of bouillon? in my project I am supposed to export different tasting bouillon to Japan, but I need to know if there is a market for it. Just a quick question: Is it possible to freeze bonito flakes? I have finally managed to get hold of some, but don't have room in my freezer to store a large volume of dashi. The open packet has been in the fridge for around a week, and I would love to freeze them, so long as they won't get spoiled. Dried bonito flakes should keep unrefrigerated (probably indefinitely, I'd think). You might want to put them in a Ziploc bag so they don't get soggy. Wikipedia says the dark version has a lower smoke point, is that the main reason for the preference of dark sesame oil? I love the Kadoya version, but I have not really explored anything else. Maybe I should. The Kadoya oil is dark sesame oil (also called toasted sesame oil or Chinese sesame oil). In the U.S., it seems to be the easiest type of sesame oil to find. Light sesame oils (such as http://www.iherb.com/Hain-Pure-Foods-Sesame-Oil-12-7-fl-oz-375-ml/33274?... ) are used in Middle Eastern and Indian cooking. The difference is largely one of flavor: the dark oil is pressed from toasted sesame seeds, and has a strong flavor (in fact, it's often used more as a flavoring than as a cooking oil). The light varieties are pressed from raw seeds and are used as mild cooking oils with little flavor of their own. I have an intolerance to gluten. Gluten is in wheat which is found in a lot of soy sauces. I saw that Kikkoman makes a gluten-free variety but do you know if Yamasa makes a gluten-free version? I would like to try your recommended soy sauce but not at the risk of becoming terribly ill. I looked online but I haven't found a gf version yet. I thought maybe you would know. I love this! I love that you have the same name as me too!